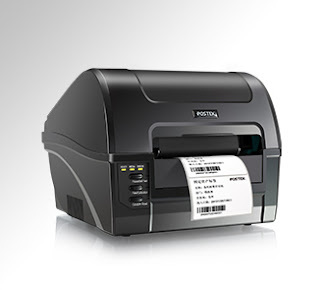 Postek C168 barcode printer is long lasting durability and ease of use, plus affordability are the hallmarks of the C168 Series direct thermal/thermal transfer compact printers. small power performers feature an astonishing large ribbon capacity of 360 M that limits downtime for reloading in Postek C168. Furthermore, as standard, these printers include an external media stand accommodating larger media rolls and optimizing production uptime. Postek C168 equipped for fast printing speeds and carries a powerful 32-bit processor enhancing efficient label throughput. 3 function buttons and 3 LED lamps make operations easy. Plus, DIP switches offer set-it-and-forget-it convenience also in Postek C168 Label printer. The two printing modes and an adjustable Reflective. The C168 features one of the most advanced industrial microprocessors; the 32 bit embedded ARM CPU, with 2MB Flash Rom and 2MB SDRAM. Its reflective and transmissive media sensor is easily adjustable allowing for greater flexibility in printing needs and media compatibility. The ability to load up to 300 meters of ribbon avoids the need for frequent replacement. The included full version of Pos Label and Label Design Software means that there are no software constraints in creating your labels. Width:110 mm max,25 mm min. Indian barcode Corporation a proprietorship since 1997 now establishes a nationwide network to supply the Barcode Products for the custom products and many other portfolios. We Indian Barcode Corporation are the authorized Distribution Partner with ARGOX to distribute the ARGOX printers, Scanners and other consumables across India. We Indian Barcode Corporation focus on adding value to your business with the quality of the material and our service. We take vanity in the variety of our products and our ability to deliver with the speed, dependability, flexibility and responsibility so often demanded in today’s business environment. We have our service center to provide the offsite service for the ARGOX Barcode printers and each and every consumable of the ARGOX Labels printers are always there in our stock. The Print Head for ARGOX Label Printer, ARGOX ribbons, Direct Thermal Labels for ARGOX printers, Thermal Transfer labels for the ARGOX printers can be purchased from us any time. You can also buy the ARGOX Printers and consumables online from our online portal www.indianbarcode.in. We are also the manufacture of the Labels for the ARGOX printers and a large number of the standard size labels are always there in our stock and special size labels can be manufactured on the orders instantly. Indian barcode Corporation now establishes a nationwide network to supply the Barcode Products for the custom products and many other portfolios. We Indian Barcode Corporation (http://www.indianbarcodes.com) are the authorized Distribution Partner with ZEBRA to distribute the ZEBRA printers and other consumables across India. ZEBRA specializes in the design and manufacture of thermal printers. ZEBRA offers a variety of thermal printers that support either direct thermal printing only, or both thermal transfer and direct thermal printing capabilities. You will find all varieties of the ZEBRA label printers their consumables such as ZEBRA Labels, ZEBRA Ribbons, ZEBRA Print heads etc. with us always in our stock. To select the correct printer for your application it is necessary to understand the difference between thermal transfer and direct thermal technology. ZEBRA direct thermal printers require the use of heat activated labels and do not require a ribbon. While somewhat durable, direct thermal labels are prone to darkening over time due to age or exposure to extreme light or heat. Direct thermal printing is popular in applications such as mailing, small parcel delivery, retail and the food industries where most items are stored away from heat and sunlight, and the expected life of the label is less than 1 year. The primary benefit is an overall lower cost since ribbon is not required, and direct thermal printers are easier to operate. Thermal transfer printing requires a printer that works with a thermal transfer ribbon and media. ZEBRA manufactures both low cost thermal transfer “desktop” printers designed to print up to several thousand labels per day, and “industrial” thermal transfer printers capable of printing many thousands of labels per day. ZEBRA thermal transfer printers are designed to print using either thermal transfer or direct thermal technology. ZEBRA ZXP SERIES LABEL PRINTER,ZEBRA S4M LABEL PRINTER, ZEBRA ZM400 LABEL PRINTER, ZEBRA 105SL LABEL PRINTER, ZEBRA P110I PRINTER, ZEBRA P330I PRINTER, ZEBRA P630I PRINTER, ZEBRA ZT 230, ZEBRA GK 420T, ZEBRA GC420T, ZEBRA GT800, ZEBRA GT820, ZEBRA GK 420D, ZEBRA GC420T HEAD, ZEBRA S4M HEAD, ZEBRA GT820 HEAD, ZEBRA ZM400 HEAD, ZEBRA ZT230 PRINT HEAD & Many more. If you have any of the further queries or difficulties regarding selecting your Label printer you may feel free to contact us.